With Smart prepaid you can now register your 15 pesos load to unli text promo valid for 1 day. You can also enjoy mobile browsing as it includes 150MB of data plus 20 minutes of tri-net calls that you can use to call Smart, Talk N Text and Sun Cellular subscribers. All of that is possible when you register for Smart All Out Surf 15 or ALLOUT15. The sad news is that this promo is only regional offer and it’s not available in NCR. Don’t worry if you cannot avail of this promo, you can register to other denominations. You can register for ALL OUT 15 via SMS keyword and via your nearest load outlet or reseller. 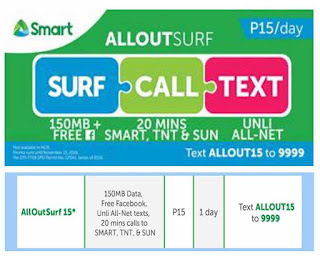 You can ask your retailer to load ALL OUT 15 promo to your mobile number, by searching the keyword or code for AlloutSurf15. 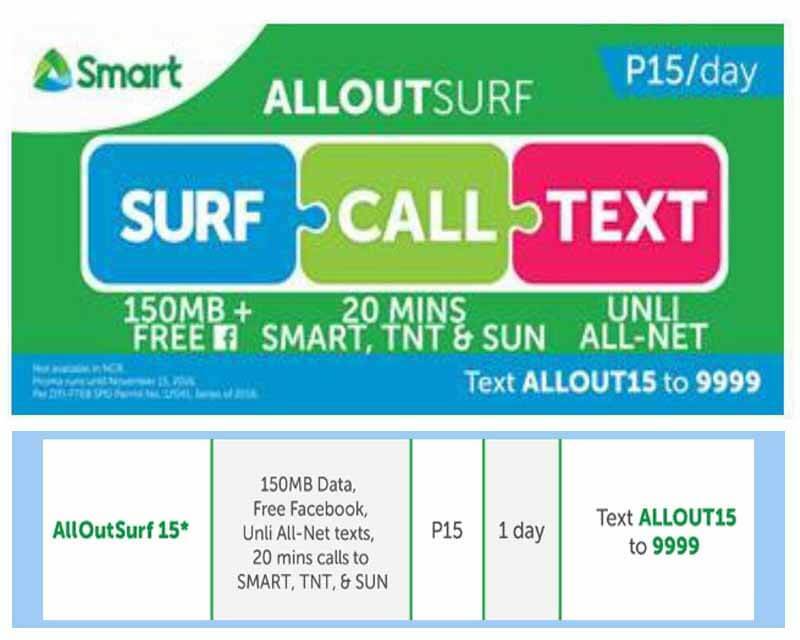 See other offers of Smart All Out Surf Promos. Make sure you have P1 maintaining balance while registered to this promo. Wait for the confirmation from Smart that says something like the message below. “You have successfully registered to All Out Surf 15! You now have 150MB data, Unli All net Texts, 10 tri-net minutes! Valid for 1 day.”. You can also all unli trinet calls for only 5 pesos, just text TALK5 to 9999 while subscribed to this promo. This offer previously includes free Facebook.